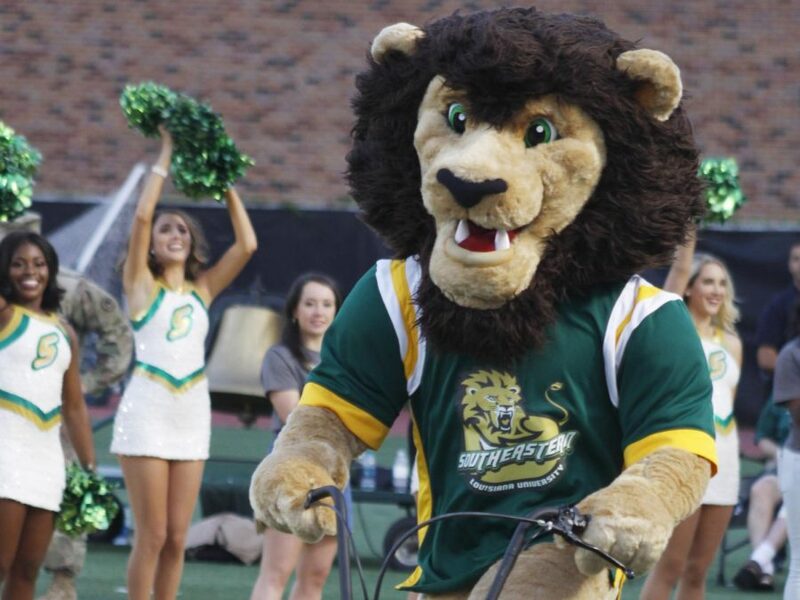 During a football game, Roomie the Lion rides on his bike at Strawberry Stadium. The university’s mascot prowls the grounds of home games and campus social events. Roomie the Lion has been the name of the university mascot since 1964 and is named after former biology professor, alumnus and student-athlete Hollis “Roomie” Wilson. Although it has been decades since the university has had a live mascot, the spirit of Roomie resides in the students who portray the lion. Students who are interested in trying out to become the mascot need to contact Director of Spirit Catherine Messenger, the head cheerleading coach for the university. Messenger explained that during the selection process, she looks for specific aspects that would make the perfect candidate. As for the student who currently represents Roomie, they believe that their personality motivated them to try out for the role. Messenger shared her approval of the current mascot since they have retained their position for years now. Between school and representing the university, the student explained their time management of duties. “They’re the most lovely,” the student said. Out of the four years in their position, the student shared a memory from one of the games they played as Roomie. Roomie not only attends sports games, but also makes appearances at events including “Gumbo Ya Ya,” “Strawberry Jam” and “Lion Pride Preview.” Regardless of what campus-wide events students attend, they are almost guaranteed to spot the Lion of the university.